← New project: Beautyjagd.de – Organic beauty news in English! Yes, this is a rather tabloid-sounding headline! 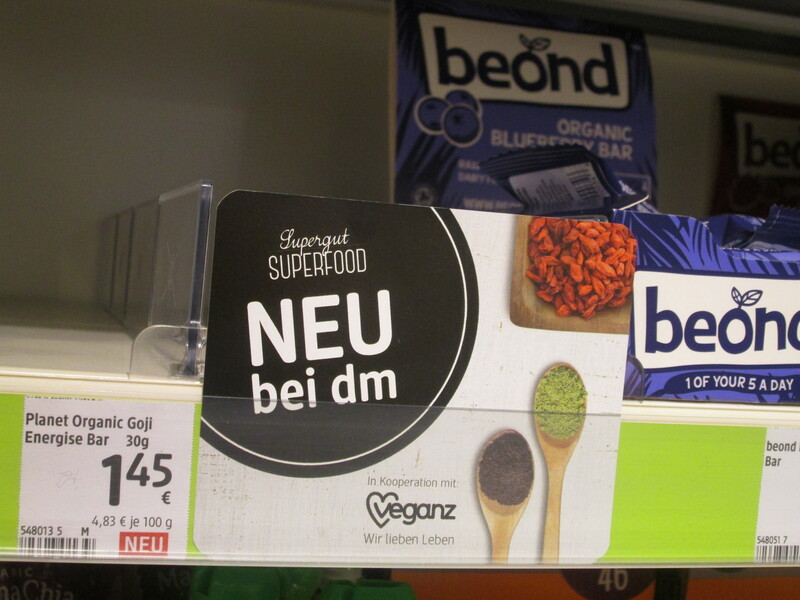 However, for the last six months German drugstore chain DM has dominated the retail headlines in Germany with a slew of interesting and innovative projects: In April, the DM group introduced its new organic food brand DM Bio (de-listing organic brand Alnatura in the process). Then, DM announced that it would launch an online store plus a brand new own label make-up brand (Trend it Up). And this July, the newspapers reported that DM had entered in a distribution agreement with Berlin-based vegan supermarket chain Veganz to retail a 50-sku portfolio of vegan brands, superfoods and raw food products. As the market leader of Germany’s ultra competitive drugstore sector, DM is already in a strong position: most popular drugstore in Germany, winner of practically every customer satisfaction survey, pram-friendly spacious and inviting stores, very affordable prices, VERY highly regarded own label brands, supports various social and charity projects, is known for its ethical corporate business practices and as a good employer. Oh yes, and unlike its direct competitor Rossmann, DM has been growing organically over the past couple of decades (no acquisitions of smaller chains or share sales to Chinese conglomerates!). In first half of the financial year 2014/2015, DM’s German business (1,686 stores) grew 10.5% to 3.48bn Euro whilst total group turnover (an additional 1,453 outlets in 11 European countries) reached 4.48bn Euro, up 9.4%. As I said, DM’s economic position in Germany is pretty solid. However, the retail group isn’t resting on its laurels. Instead, DM is rapidly and strategically expanding its brand selection, primarily through own label brands (DM Bio in organic food and Trend it Up in colour cosmetics) but also by investing in strategic distribution agreements (Veganz). After all, the second-biggest player in the German market, Rossmann, has the financial power of Hong Kong based retail conglomerate Hutchison Whampoa behind it (for those who are interested: Hutchison Whampoa’s subsidiary AS Watson acquired 40% of Rossmann’s shares in 2005). Rossmann has been expanding aggressively in Germany for the past few years but so far, has not managed to knock DM down from its top spot. With DM Bio, DM has introduced into its first organic food brand. A logical step: organics are still registering strong growth, even in a comparatively saturated market like Germany. And competitors Rossmann and Müller (a Southern German drugstore chain and the third-biggest drugstore retailer in Germany) have had proprietary organic food labels for years, so it really was time for DM to bring out its own organic brand. And DM is no stranger to the organic industry: 35 years ago, the DM chain began distributing the products of German organic manufacturer Alnatura in its stores, making DM one of the very first retailers in Germany to sell organic foods outside of the Reformhaus sector. The launch of DM Bio has brought this cooperation with Alnatura to a rather rapid end and DM has already started to de-list Alnatura from its stores. The cooperation with Veganz is particularly interesting: vegan, superfoods and “clean” foods (gluten-free, lactose-free etc.) are growing strongly and superfoods in particular (typical superfoods are chia, baobab, moringa, chlorella, açaí, wheatgrass, hemp, maca and so on) are one of the major trends in the organic food industry. Initially, only 54 of DM’s German outlets will feature the new food line-up. If the trial is successful, however, the portfolio will then be rolled out to further DM stores across Germany. The 50-sku line-up that Veganz has developed specifically for DM includes sports foods and supplements, superfoods and vegan products. 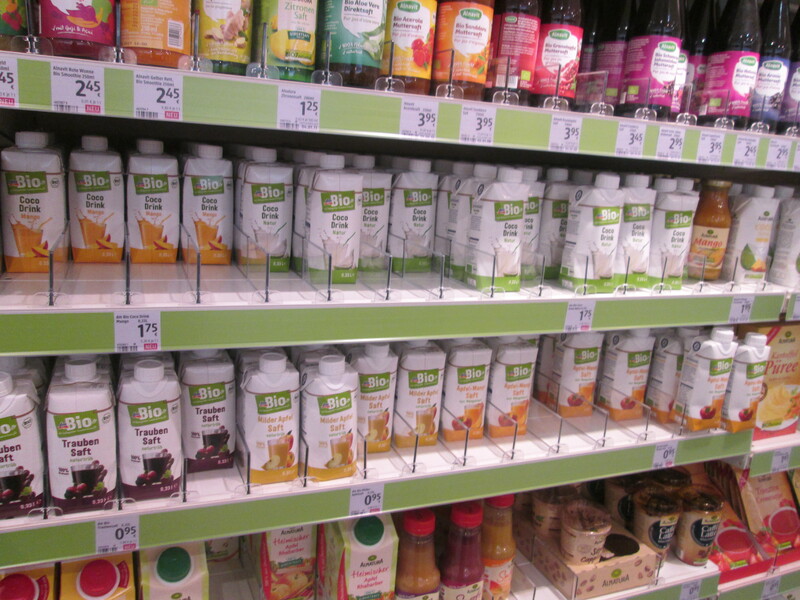 Founded by Jan Bredack, the Veganz chain opened its first vegan supermarket in Berlin’s Prenzlauer Berg area in 2011. 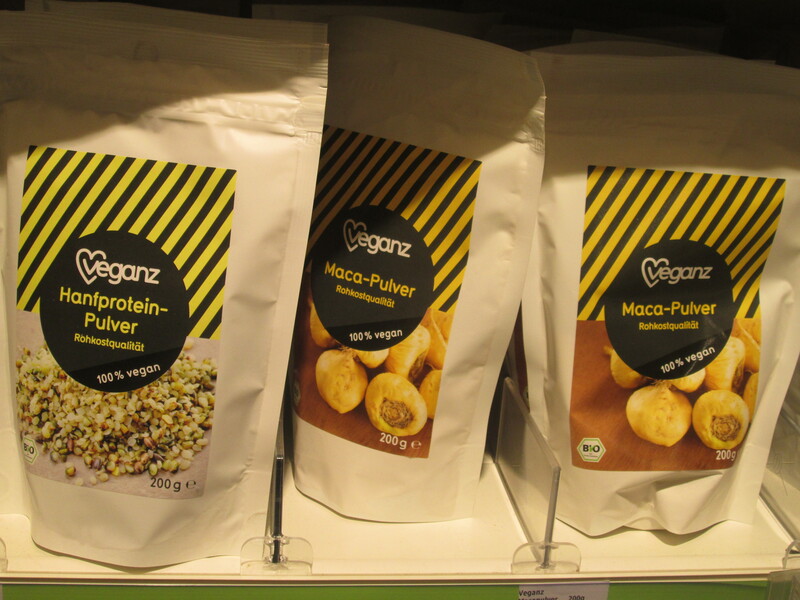 Today, Veganz operates nine stores in Germany and Europe (this September they are opening the tenth store in Berlin’s Kreuzberg neighbourhood) and the group continues to grow its annual turnover. In April 2015 they launched a proprietary food range. Veganz is also currently planning their US market entry – I recently interviewed Bredack for a company profile in trade publication Organic & Wellness News – and undoubtedly they’ll also continue with their European expansion. Definitely one to watch, this supermarket retailer! 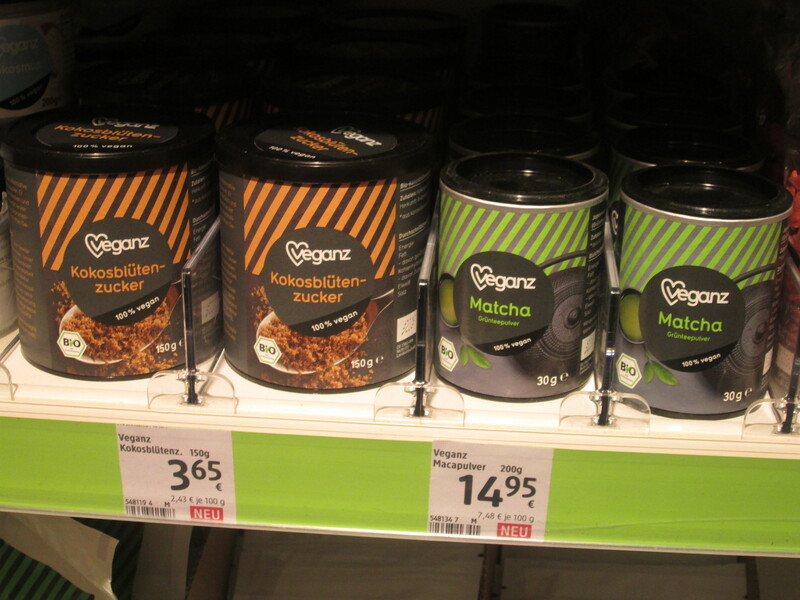 In Germany, Veganz is already on its way to become a key vegan food distributor: in late 2014 the company began distributing vegan brands in conventional German supermarket chains such as Globus, Kaiser’s, Edeka, usually under the Veganz store logo. This summer, the Metro group’s Cash & Carry supermarkets became a Veganz distributor which means that Veganz is now poised to enter the wholesale and food services industries. DM is Veganz’ first drugstore distribution partner. 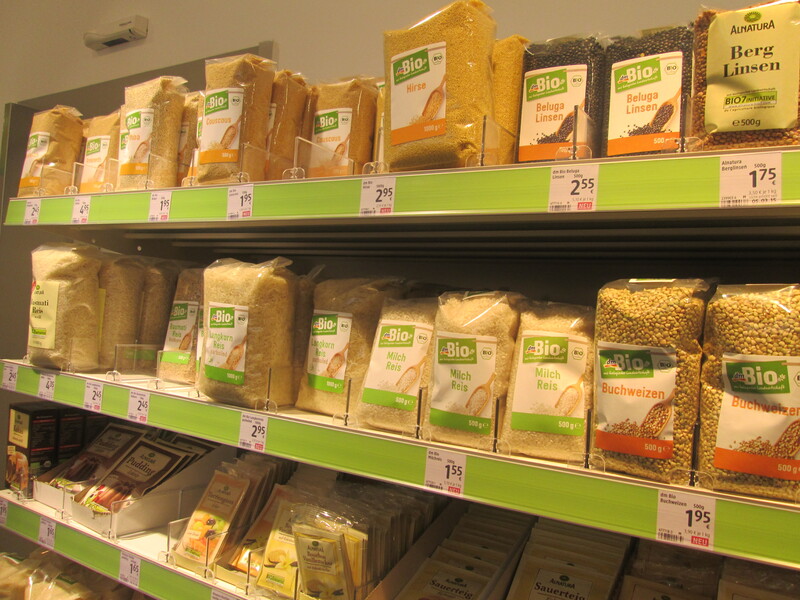 And as far as I know, neither Rossmann nor Müller have a dedicated vegan/superfoods portfolio. At least not yet. Selling drugstore goods online in Germany is a bit of a low-margin business. Prices for mass market C&T are very cheap to start with; add to this the dense store network of the DM, Rossmann, Müller and Budnikowsky chains (Budnikowsky is a regional drugstore retailer in Northern Germany) and selling an own label shampoo for 0.55 Euro online will most likely not generate a big profit. For years, Rossmann was the only drugstore chain with an online shop. In 2014, Müller launched its own online store (then again, Müller carries a wide range of premium fragrance labels) and now DM has followed with its own online presence. Personally, I would never order stuff from DM online but then I have at least five DM stores within a ten minutes walk from where I live! In the rural areas there are fewer drugstores so it makes sense to give customers outside the urban areas the opportunity to buy their favourite DM products online. DM and Müller both offer the option of ordering products online and collecting them in-store which might also appeal to customers living in large cities. 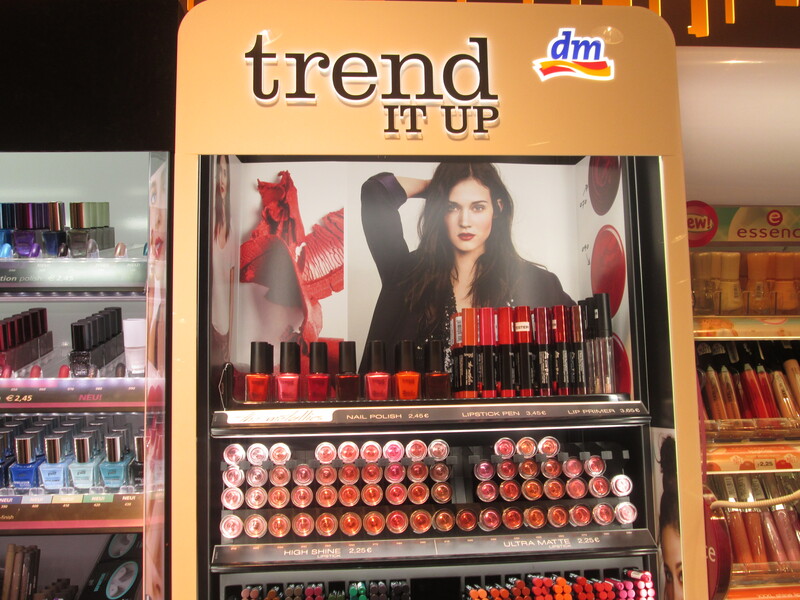 A couple of weeks ago DM’s new colour cosmetics brand Trend it Up was rolled out in DM outlets across Germany. The brand has a fabulous portfolio of nail care, lip products and eye makeup; the packaging is stylish and product prices are on par with Germany’s other major budget colour cosmetics brands: Cosnova’s Essence and Catrice, Maeva’s P2 and Coty’s Manhattan. The main focus of the new brand lies on nail care and nail polishes – the Double Volume & Shine range, for example, comprises 27 shades while the mini nail polish range No.1 includes 16 colours. In addition there are 15 different bases, top coats and other treatment polishes, with prices of around 2.25 Euro for the colour polishes and 1.95-2.45 Euro for the nail treatments. There are three lip colour ranges which are priced between 2.25 Euro and 3.75 Euro, six different mascaras for around 3.95 Euro and kohl pencils for 1.95 Euro. Every two months there will be a limited edition (limited editions are a staple in the German colour cosmetics market and a must for any make-up brand targeting the teen and young adult market!) and DM has already announced that eventually Trend it Up will also include face products such as foundations, powders and blushers. 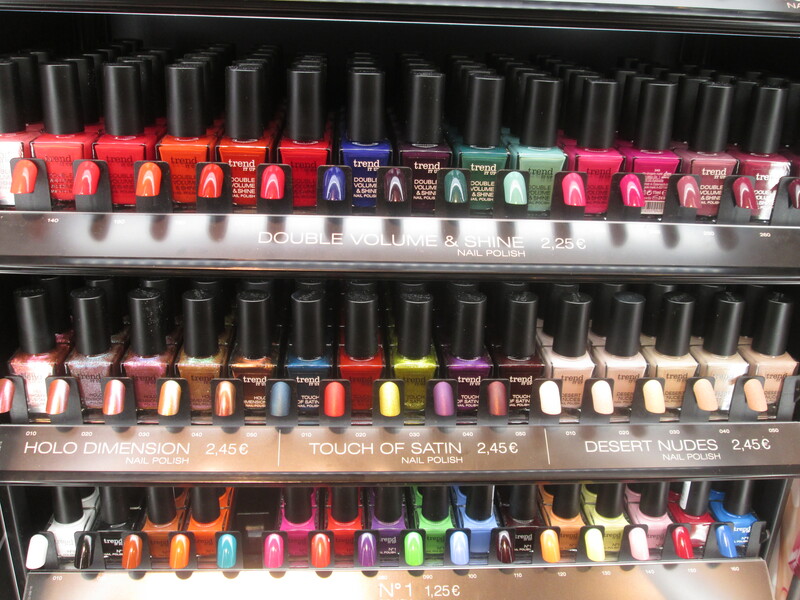 So far, teen brand P2 has been DM’s go-to nail polish range – P2 has one of the largest selections of colour cosmetics in the German mass market, with a particularly strong line-up in hand and nail care. And although P2 is not one of DM’s own label brands, the retailer has the exclusive distribution rights for P2 in the German market, so P2 is treated like a proprietary brand. Or at least it was until now. P2 was recently acquired by French Maesa group – the previous owner was Austrian lingerie brand Palmers – and I would imagine that this could/might (perhaps!) determine the future fate of P2. In the long-term. Who knows. Anyway, since Trend it Up has such a strong focus on nail care, DM has announced that it will scale back P2’s nail polish range and instead position Trend it Up as its primary nail care brand. And to bring this back to DM’s competitors: until recently DM’s own label range has actually had a bit of a strange gap in it. DM has a wide range of very well-regarded proprietary brands; especially the Balea umbrella brand (Balea covers all major C&T sectors: face care, body care, hair care, men, babies, sun care and so on). And Alverde is DM’s big organic brand in personal care and colour cosmetics. 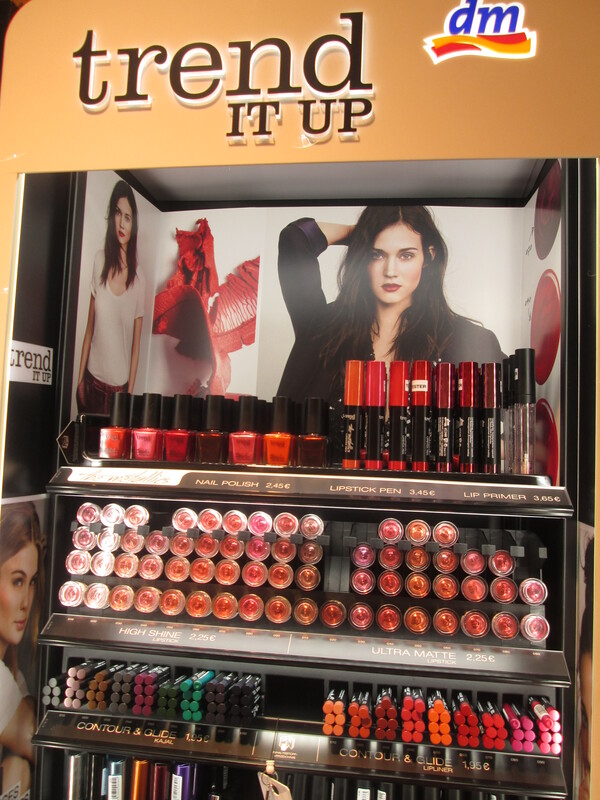 However, until the launch of Trend it Up DM had no conventional colour cosmetics brand. In comparison, Rossmann’s main own label brand Rival de Loop has had a highly successful colour cosmetics range for years – there is even a teen spin-off called “R de L Young”. And although the Rival de Loop products are not half as attractive as Trend it Up (Rival de Loop’s packaging always looks a tad cheap), it is one of the best-known Rossmann brands and, presumably, has a loyal following. Trend it Up in particular is set to stir up the colour cosmetics market: not just because the products are attractive and very competitively priced but primarily because DM has such a very wide distribution in Germany. And it is an incredibly popular company. The German colour cosmetics market is quite lively anyhow: the Cosnova brands, P2 and, to a lesser extent, Manhattan (ever since they were sold to Coty a couple of years ago it is my impression that Manhattan has lost its creative spark – this is my personal opinion!!!) keep things interesting, especially with the many limited editions. Compared to these four brands, the other big players in the German market – L’Oréal Paris, Maybelline, Astor, Max Factor and so on – are staid and, quite frankly, a bit boring. Again, personal opinion here! It should be interesting to see if – and how – Rossmann will react to DM’s new and more offensive expansion pace. 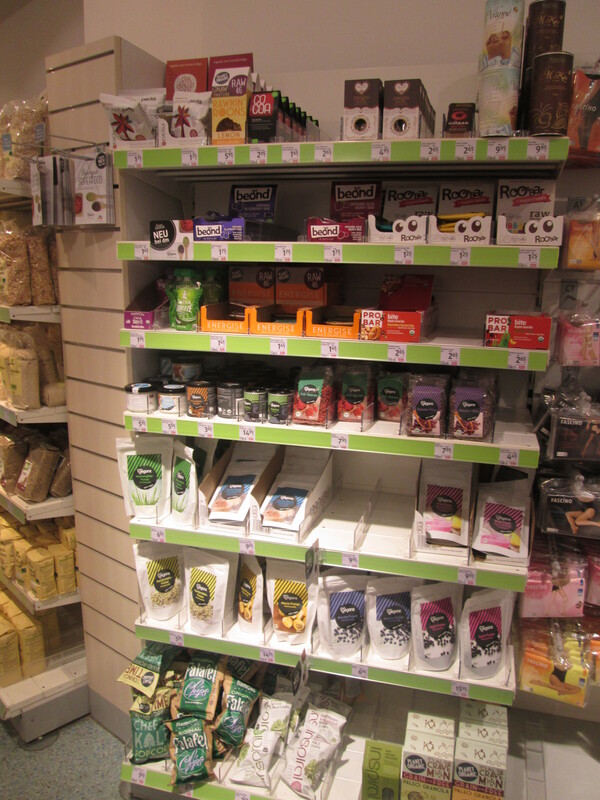 I’m willing to bet that in the not too far future, Rossmann will also launch a range of superfoods or vegan products. The Müller chain, on the other hand, can afford to be more relaxed about DM’s recent string of innovations: although Müller is considered a drugstore chain, the group has more of a department store approach. The Müller stores in Southern Germany (Müller’s stronghold region) are multi-level retail outlets selling personal care, luxury perfumery, confectionery, toys, CDs and DVDs, haberdashery, household supplies, interior decoration and DIY supplies – very a broad portfolio which means that Müller doesn’t have to entirely depend on its C&T turnover.